Shri Rama is loard of world . We can learn many things from personality of Shri Rama which I can make following list . 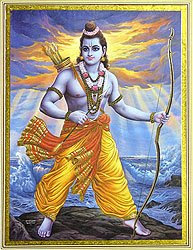 Shri Rama spent 14 years in forest for obeying the order of his parents . So , we should also obey the order of our parents . Shri Rama respect and love his wife and for bringing from jail of Ravana , Shri Rama fighted with king Ravana and brought his wife from his kindom. We should also respect and love of our wives and for security of life of them , we should fight from evils . Shri Rama believes in one wife , So , we should also keep only one wife . Shri Rama and love with his brother Shri Lakshma teach us to love with our brothers . Shri Rama always fought with Rakashsa , so we fight today corruption , poverty Rakshsa like Shri Rama . Shri Rama is great personality of this world . If we study Ramayana , we can get many important part of his life with this we can learn so many thing from Shri Rama . Shri Rama is sign of bravery , if you want to learn bravery , then you can learn from personality of Shri Rama. Shri Rama is form on his promise " Jana Jaya per Vachnam Na Jaya " It is the concept of Raghukul Rit . Shri Rama spoke always truth because he was in the kul of Satyavadi Harishchandar , So we should also speak truth in our life . Shri Rama is so great that we deem him as loard of world and We all Indian are so lucky that today 314/2009 we are celebrating his birthday as RamNami . It was very nice of you to leave such an important advice by using a very gifted person like Shri Rama.I learned a lot. I liked the way how you organized your posts with the pictures. Thanks for commenting , I think you are also lover of great hero India Shri Rama ! Above article is not just article but this is the voice of my heart and I wrote what is the truth . Jay Shri Rama ! Jay Shri Rama ! Its really nice of you to write such an Important advice about man.I have one doubt if Ram is such a wonderful person then how come he told Lakshamana to leave Sita in Jungle. I respect Lord Ram a lot but their is a always a doubt in my mind, why Ram thought of leaving Sita in the jungle? I mean just over a few comment of people he left Sita even though he knew she was pure loved him dearly and he betrayed her. Why did he ruin her destiny? Why couldn't he just leave the kingdom and go along with Sita? This all mean that he himself don't trust Sita Mata.? Ya one more thing that In kaliyuga we should follow shri Krishna b'coz here if u r deplomate then only u will survive. But if we follow Shri Ram then nobody allow us to get our own things. Atleast we can try to follow Geeta.. what do u think.?? The story is mixed by some selfish people . I think Rama never leave Sita , After killing of Ravana and getting Sita from his slavery , after all story is presented mixed for putting stigma on great personality of Shri Rama . Shri Rama never leave his wife alone and never Any Good Indian leave his wife alone .